Sometimes a peanut butter and jelly sandwich really does do the trick, but what about the times you want to invest in a personally prepared fine-dining experience? Every kitchen is different in size and scope, and every meal requires a different touch, but it all comes down to ensuring you have the creative tools to bring your ingredients together. It all starts with good timing. 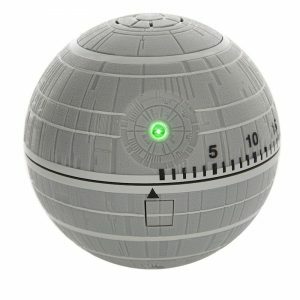 You might as well have a little fun with it and turn to the Star Wars Death Star Kitchen Timer, which has scale-model detail and even casts off the green super-laser when you’ve hit the mark. The Death Star can be set up to 60 minutes, and has sound effects to keep you entertained while you’re toiling away on your meal. In the end, all the slick equipment in the world can only get you so far without the best ingredients. If you have patience and enjoy being hands-on with in-home gardening, the Haut Potager is a terrific choice for those who aren’t necessarily green-thumb savvy. 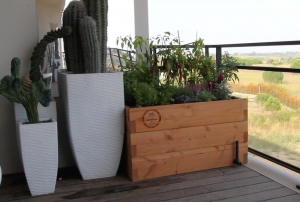 This compact gardening system comes with organic substrate material and can be altered to accommodate any other materials you see fit. One key to healthy growth is proper watering, and the Haut Potager requires one manual watering before self-regulating its dosage—no need to be concerned about too much or too little, with up to 80 percent water-saving efficiency. 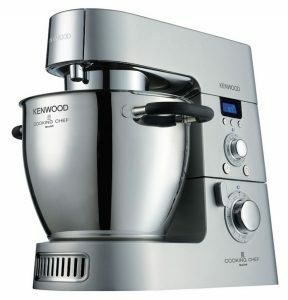 Once you’re ready to place your ingredients, this first-of-its kind planetary mixer does much more than “mix”; the Kenwood Cooking Chef is basically the Swiss Army Knife of kitchen appliances, functioning as a steamer, a blender, a chopper, and an oven/stove top. If your space is limited, the Cooking Chef is especially appealing and saves time in general. No matter how compact and innovative appliances can be, the essentials will never change. 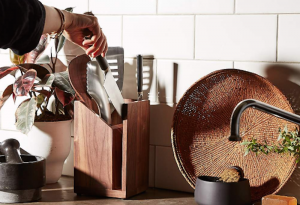 One nice thing about the Material Kitchen Fundamentals Utensils is that you have everything within reach, and the storage base can be tucked away pretty much anywhere and still look good. It comes with 6 distinct utensils, but works with anything you might already have on hand for backup. As in any endeavor, safety is a priority when cooking. 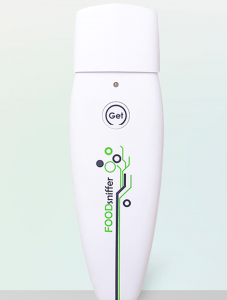 The FOODSniffer is the world’s first handheld device developed to seek out freshness levels in your meats and poultry. By communicating with the ap on your phone, the FOODsniffer will sense spoilage and display the test results, alerting you to any issues with your hopefully fresh meats. The sensor analyzes gas levels within seconds, taking the guessing game out of preparations. If your meat is up to snuff (or vegetables too), it’s time to reach for the smoker—inside the kitchen? With the Kitchenque Stovetop Smoker, you can ditch any outdoor preparations and utilize any gas or electric stovetop to smoke indoors. The smoker can reach temperatures as high as 400-degrees, doubling as a cooking appliance if you’re looking to speed things up. You can get creative on how you want to flavor your smoking, but the Kitchenque does come with Hickory InstaSmoke superfine wood, and other variations are available. 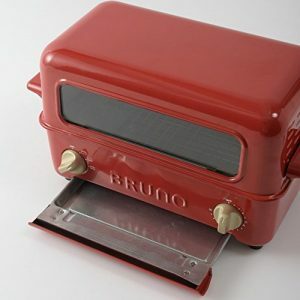 Continuing to keep things indoors and right near your cooking space, the BRUNO toaster grill and oven is fairly self-explanatory: it toasts, it grills, and is a classic kitchen appliance that looks the part. 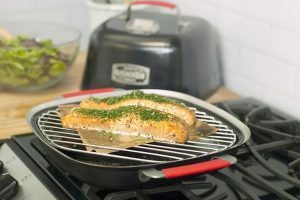 Like the Hestan Cue Smart Cooking System, which basically replaces a stove and services the growing tiniest-of-house living environments, the BRUNO fits around any particular kitchen restrictions. After all the hard work in the kitchen, enjoying the well-deserved fruits of your labor, finish the evening with liquid desert. 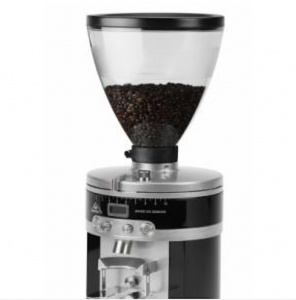 The Mahlkonig K30 Vario coffee grinder isn’t cheap, but you’ll be hard pressed to find a better way to the perfect cup of coffee. Electronically controlled dosage and grind profile, high-precision cutting discs, and the ability to adjust single and double shots within a tenth of a second are a few of the Mahlkonig’s features. Good food doesn’t need to be complicated and take a restaurant-size kitchen to reach wonderful results. Save the time and energy for relaxing around the dining table!